Digital humanitarian volunteers have been busing tagging images posted to social media in the aftermath of Typhoon Yolanda. More specifically, they’ve been using the new MicroMappers ImageClicker to rate the level of damage they see in each image. Thus far, they have clicked over 7,000 images. Those that are tagged as “Mild” and “Severe” damage are then geolocated by members of the Standby Volunteer Task Force (SBTF) who have partnered with GISCorps and ESRI to create this live Crisis Map of the disaster damage tagged using the ImageClicker. The map takes a few second to load, so please be patient. The more pictures are clicked using the ImageClicker, the more populated this crisis map will become. So please help out if you have a few seconds to spare—that’s really all it takes to click an image. If there are no picture left to click or the system is temporarily offline, then please come back a while later as we’re uploading images around the clock. And feel free to join our list-serve in the meantime if you wish to be notified when humanitarian organizations need your help in the future. No prior experience or training necessary. Anyone who knows how to use a computer mouse can become a digital humanitarian. 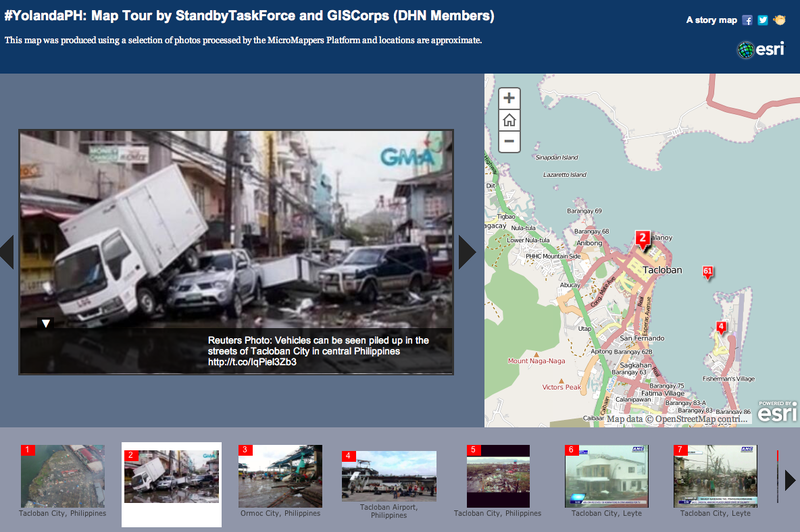 This entry was posted in Big Data, Crisis Mapping, Crowdsourcing, Humanitarian Technologies, Social Computing, Social Media and tagged DHN, ESRI, GISCorps, MicroMappers, Philippines, SBTF, Typhoon, Yolanda. Bookmark the permalink. Keep up the great work, Patrick and team! Would be useful to also have the Palau and FSM information on the map. These countries are invisible in most reports and yet also suffered great devastation. I completely agree, our mandate from the UN is the Philippines, other members of the Digital Humanitarian Network have focused on Palau, et al. Thank you. Thanks Paul, I linked to this map in my post as well. Hello,, being more and more experienced with Ushahidi 2.x I keep on wondering how ever this event cannot be used to foster and improve it in terms of functionalities (adding the deadline feature for any report useful for using Ushahididi as person finder too etc.) From the developemnt trend its clear that the Ushahdi 3.0 is becoming more and more less a crisismap but a social application. Thanks Gilles, feedback we’re getting from UN folks on the ground and in Geneva is that the Crowdmap is cumbersome to use and not ideal re data visualization. That’s why they’re going with the first Crisis Map displayed in this blog post. 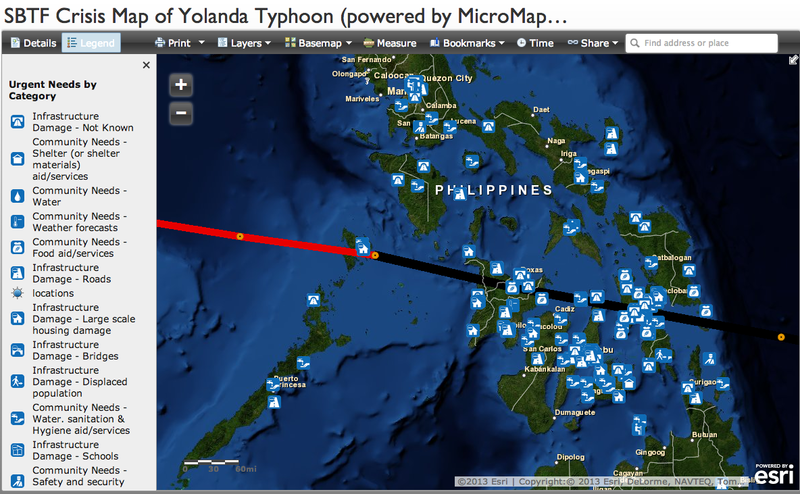 But I believe my SBTF colleagues are in touch with @visov1 to upload the Crowdmap data to the Crisis Map. Thanks again. This is really amazing, incredible work being done. Always things to learn, really great that you’re doing this! Pingback: Natural disaster, health care + social media. Where do they converge? | Allgood Aims Around the World. Is there any collaboration between DHN and DigitalGlobe with the crowdsourced damage assessment being done with their Tomnod platform? Yes via the CrisisMappers list-serve. I invited Tomnod to apply for DHN membership, which they have. Unfortunately, the DHN Coordinators have not yet gotten around to reviewing their application.